From sold out soccer stadiums in Mexico to packed arenas in Asia and abroad, Jonni Lightfoot has toured extensively throughout the world since becoming a member of Air Supply in 2001. Lightfoot, a native of Salt Lake City, performed before 175,000 people in 2005 as part of only the second Western group to ever play inside Cuba. 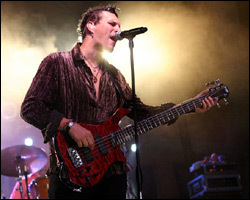 Along with his bass playing duties in Air Supply, Lightfoot has also assumed the roles of the band's studio engineer and musical director. 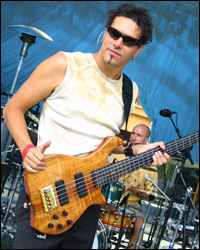 As the leader of his own projects, Lightfoot has emerged as an expressive solo bassist on the piccolo bass while revealing his versatile musical vocabulary on three studio recordings including his debut Copper Street Fair in 1996, Pendulum in 2001, and the highly anticipated Blu which was released in 2006 and features tracks with performances from members of Air Supply and legendary solo bassist Michael Manring. Today, Lightfoot continues to broaden the boundaries of conventional application and utilizes the bass as a lead instrument in his own bass-fronted band. In the following interview, Lightfoot discusses his most recent project as a solo artist, touring with Air Supply, playing piccolo bass, using altered tunings, and more. When did you become involved with music? I became involved in music when I was 11 years old. Some of my friends decided to start a band, and they needed a bass player. I didn't even know what a bass was at the time, but I went home to talk to my mother about it. The following day, she took me to the local music store and bought my first bass. It was an Ibanez Destroyer. I have always had music in my family. At home, my older brother played guitar, and I would go into his room to listen to him play. My father also played guitar, and I would watch him as well. However, the real musician in the family was my grandfather. He played everything from guitar and banjo to mandolin and violin. He used to play every night in his youth calling square dances, and that is how he met my grandmother. Was bass the first instrument you learned to play? No, but it was the first instrument I took seriously and really learned how to play properly. I had always tried strumming my brother's guitars because he taught me a few chords but not much more. In school, I also played the french horn, but I was horrible! When I finally picked up a bass, I knew it was the right instrument for me. 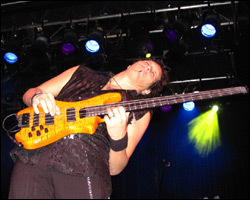 Do you feel that your experience on different instruments has helped your bass playing? As time passed, I did start to pick up other instruments such as guitar, keyboard, and piano which I continue to play. These other instruments helped me understand the function of the bass a lot more. For instance, I think the piano is the best instrument for writing songs because everything is just laid out in front of you to look at. It's easy to see the chords, harmonies, and bass lines. Translating this information to the bass was very easy for me because I could see it. I picked up guitar again in the early 1990's to play in a rock band. I really just took my knowledge from bass lessons and applied it to the guitar. When it came to soloing, I struggled for a long time with it and mostly just stuck to pentatonic scales. With time and experience, it became easier. Once that band ended, I picked the bass back up, and that is when it all made sense to me. Without a doubt, playing other instruments helped out with my bass playing, and I would recommend to all musicians that they pick up other instruments and learn about them as much as they can. Which bassists have had the most profound influence on your playing? There are so many. I would have to say the first bassist I really took notice of was Geddy Lee from Rush. I grew up in the 1980's rock scene so I didn't know about Jaco or Stanley Clarke. I only knew about the main rock bassists. Geddy grabbed my attention because I noticed how his bass lines weren't just doubling the guitar parts. I started to work out my own playing using the concept of not following the guitar lines so much and using harmony notes and counterpoint lines to make the songs more interesting. Then, I heard Billy Sheehan with the David Lee Roth band. It was all over. Sheehan's bass solos were doubling the guitar solos, and I had to do that. It wasn't until I was older that I realized what Jaco had done before all that. I really wish I would have known about him when he was alive and been able to see him perform. Next, I heard about Michael Manring. I think he had the most to do with me becoming a solo bassist, or I should say he had the most influence on me when it came to writing solo bass pieces. I remember picking up Drastic Measures and just being floored by his solo bass arrangement of "Purple Haze." I bought every record he had made or ever played on and learned what he was doing. I also have to say that I listen to everything that bass players are currently releasing because I just love to hear the ideas that are coming out of today's players. They are all amazing. Can you tell us about the material on Blu? Blu took about four years to complete. I began writing it after I joined Air Supply, and due to the heavy tour schedule, it just took awhile to finish. I believe I started with about 30 tracks for the record, and I narrowed it down to 15 for the final product. All the material for the project was recorded and mixed at my house in Salt Lake City so that made it real easy to work on when I was home. Unlike my previous two solo recordings, I feel this one is more bass-oriented. Blu has four solo bass pieces on it. The first of these solo pieces, and probably my favorite, is "Flutterbys." It started as a piece I wrote for my solo spot in the Air Supply show and then turned into a full blown track for the record. It's a fast moving, two-handed tapping piece. It's a real blast to play. I also really like the opening song, "Say Hi To The Monkeys." It's a funk piece that just sits in the pocket for the whole song. It has a nice slap bass section in the first verse, and then Michael Manring plays on the second verse. The thing that I really enjoy about this song is the chorus section because it has a line sung by Graham Russell of Air Supply and myself with the bass following what we sang. It's just a fun little groove that stays with you. How is Blu different from your previous solo projects? It's very different. There seems to be more funk playing on it than my previous records, and hopefully each album I've released has grown and changed from the previous one. If not, I am not progressing as a songwriter or musician. One of the biggest changes on this recording was Michael Manring's involvement. He played on three songs including "Say Hi To The Monkeys," "Slither," and "Colorful." Having him on the project was a lot of fun because his parts are from so far out in left field, but they fit the songs perfectly. On the song "Slither," I got the chance to do eight-bar trades in the solo section with him on bass. That was so much fun. I also had Graham Russell's help in writing a song, producing, and he sang on three songs. My first record, Copper Street Fair, really focused on piccolo bass playing in a band with a singer, and Pendulum focused a lot on guitar and bass soloing together. With Blu, I really wanted to make a bass album. Where can someone purchase your solo recordings? 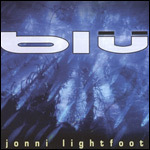 Right now, the best place to get Blu would be on iTunes or you can get a hard copy from CDBaby.com. You might be able to get a few copies from Zon Guitars as well. How did the gig with Air Supply come about? I was working at a local guitar shop in Salt Lake City. Graham Russell had just moved there and came into the shop one day. I didn't know who he was at the time, but I just went up and asked if I could help him find something. As time went on, he kept coming into the store and buying gear from me. I eventually moved to another store, and he followed me there to buy his road and studio gear. One day he came in asking if anyone knew of any bass players. The other salesman referred him to me so he came over and talked to me about the gig. He asked if I was able to travel to Las Vegas the next day and see them perform. I couldn't because I had prior commitments in Salt Lake City that weekend, but I told him I was available the following week for anything he might need. He ended up hiring someone else, but almost one year to the day, he came back and told me the guy he hired wasn't working out. I wasn't doing anything that weekend so they flew me out to a gig, and I saw the show. After the show, Graham, myself, and both of our wives got something to eat. Graham asked my wife if I could do the gig and she said absolutely. That is all he needed to hear. The following week, I was on a month-long tour with Air Supply through three countries. The funny thing about this whole deal is that they never heard me play until I was on stage with them in South Dakota. We didn't have any rehearsals before that show so it was really a trial by fire. Graham and Russell believe in vibes so I guess they got a good one from me when I was hired. Can you take us inside a typical day on tour with Air Supply? There is actually not a lot that goes on. The crew leaves for the gig around noon to setup and get things happening. The band will sometimes go out in search of coffee or something cool to see in town. Graham and Russell stay in their rooms. Graham always has a guitar in his room, and he is always writing new songs, working on melodies, or changing the live show. I always have a Zon VB headless bass with me, and I try to get in a couple hours of practice a day on the bass. The whole band meets at around 4:30 PM in the lobby of the hotel and then goes to a 5:00 PM soundcheck. We run through a couple of tunes, work on some harmonies, maybe a new song, and that's about it. Once we are done, we stay at the gig, have dinner, play indoor football, and then get ready for the show. After the show is finished, the whole band always does a "meet and greet" for the fans which will generally takes one to two hours. Then, it's back to the hotel to sleep and get up early the next day in order to fly to the next city and do it all over again. What was it like to be a part of the second Western act to ever perform within Cuba in front of 175,000 people? It really felt like a once in a lifetime experience. Air Supply was playing in South America, and a couple of shows got cancelled. The promoter asked us if we would like to go to Cuba and perform instead. When we got there, we had a couple of days off, and we got to see a little bit of Havana. The promoters took us to a music college where we got to see some of the local musicians, and they performed for us. It was a real treat, not to mention the level of talent they had was amazing. The day of the show arrived, but we weren't sure if the performance was going to happen because we had just heard that hurricane Dennis was going to hit Cuba. The outdoor concert went on but not without high winds and a little rain. As soon as I hit the stage, I was blown away because there were people for as far as the eye could see. Everyone was singing along and having a great time. I didn't want it to end. We were supposed to do a second night at a different venue, kind of an invite only, but the hurricane hit that night and we had to cancel. Back in the hotel while the hurricane was going on, a couple of us had acoustic instruments, and we gave an encore performance in the ballroom. It was a truly magical evening. What does your bass rig consist of for a live show with Air Supply? I use two Gallien-Krueger 410RBH cabinets with a G-K 1001RB-II head, a Korg DTR2000 tuner, and a Shure wireless system. I also use a Digitech GNX4 effects processor. I play two Zon basses on the road, one 5-string and one 4-string. The 5-string is a Legacy Elite, and the 4-string is the headless Zon VB. How did you get into playing piccolo bass and altered tunings? After being in and out of a few bands, I found myself looking for a new sound so a friend took me to a Brian Bromberg clinic in Salt Lake City. Seeing him perform on the piccolo bass really inspired me to put together my own band with two bass players and no guitarists. It was the sound I was looking for. I started doing some research on piccolo bass players, and of course, Stanley Clarke's name was at the top of the list so I picked up his music and studied it. I began writing my own stuff on my piccolo bass but found it limiting at first. Inititally, I tuned the bass like the top four strings of a guitar (D-G-B-E), but I also started exploring open tunings. When I played guitar, I used a lot of open tunings like D-A-D-G-A-D, open E, and open G so I already had a little knowledge. I just tuned the bass that way and applied what I knew to the main voicings. What kind of strings do you prefer for piccolo bass playing? I use GHS strings on everything I own. For piccolo playing, I use gauges .050, .040, .030, and .018. On my tenor basses, I use a little heavier gauge, .065, .055, .045, and .035. On my 5-strings, I use the steel string Bass Boomers with a .128 as my low B-string to .045 as the G-string. Has playing piccolo bass influenced the way you compose? Without a doubt, the piccolo bass has influenced the way I compose, but when I play piccolo bass instead of regular bass, I approach the instrument in a different fashion. They both might be basses, but to me, they are two completely separate instruments. First, I have to figure out if I'm writing a track as a solo bass piece which would mean using piccolo bass or tenor bass or if it will be a regular bass tune. I also have songs where I use both regular bass and piccolo bass in the same arrangement. I typically write on the piccolo bass first and then transfer it to guitar or regular bass if need be. Do you have any particular altered tunings that you favor? I will sometimes just pick up my piccolo bass and start moving the tuners to form a chord and roll with it. I'll figure out what the tuning is later, but I do like drop D, drop C, and open G.
What advice would you offer someone interested in experimenting with altered tunings? Go for it! It's a great way to explore your instrument and a great way to write new material. I would definitely recommend using an instrument with a composite neck. When placed in higher tunings, strings can exert a lot of pressure on the neck and bridge which can result in bowing and warping wood necks. A bass like one of my Zon's is strong enough to handle any tuning, and I can even leave my Zon's tuned to any particular tuning for months without worrying about damaging their necks. Altered tunings really make you think about the bass and its role differently, but the bottom line should be about having fun. Do you play shows as the leader of your own group when you aren't on the road with Air Supply? I do, but it has been really hard to schedule my own shows over the past year due to the Air Supply tour schedule. We performed close to 200 concerts in 2006 so that leaves almost no time at all to do anything at home other than laundry, pack, and hit the road again. My live band consists of lead bass, guitar, rhythm bass, keyboards, and drums. It's a lot of fun playing with them because they are all great musicians and really close friends. Plus, it gives me the opportunity to step out of the box and let loose. When I first formed the band, I was the only bass player, and every time I wanted to solo, all of the low end would drop out of the mix. I hired a close friend of mine to cover my parts when I solo, and then we play in octaves when someone else is soloing or singing. It really is a lot of fun playing that way.